If you’re looking for a hilarious and fun animated adventure that delivers entertainment in spades to children of all ages, then look no further than Smallfoot. Right out of the gate it’s clear that Smallfoot is going to be a unique tale as it takes the story of the elusive Bigfoot that has been passed down by humans for generations and turns it right around by having the story focus on a village of Yeti that live high up on a mountain, hidden to the world below by clouds that surround it, and on this mountain it’s humans – or smallfoot – who are the subject of folklore. The story focuses on Migo (Channing Tatum), who, like most yeti who live in the village, follow the laws of the ancient stones. These stones are worn as a robe by the Stonekeeper (Common) who helps keep order among the village using these laws so that everyone does the daily tasks required to make sure the village doesn’t fall through the clouds and into the nothingness that’s said to be below. You see, the stones tell the story of how the mountaintop is being held up by mammoths who are below the clouds, and if the village doesn’t provide them with the required nourishment of ice balls each day, then that will be the end of their village. While there are hints of religious tones in the story it’s not set up as a warning sign about having faith in something bigger, but more as a story about how blindly believing something can be just as dangerous as seeking out the truth. Migo’s father, Dorgle (Danny DeVito) is the village gong ringer, waking up each morning at the crack of dawn and with the help of Migo, he slingshots himself across the village, slamming headfirst into the gong to wake up the sun. He does this because that’s the only way to summon the sun according to the ancient stones. Migo is next in line to become gong ringer; however, during a practice run he misses his mark and lands outside the village walls near the edge of the mountain. It’s here where Migo has a chance encounter with a smallfoot after a plane crashes atop the mountain. Much like the human encounters with bigfoot in stories we’re familiar with, Migo is unable to prove what he’s seen to his fellow yeti, as all proof vanishes from the hilltop, falling below the clouds into the unknown. This does, however, kickstart Migo on a different path, questioning the stones and all he’s ever known. So he, along with a small group of yeti known as the Smallfoot Evidentiary Society – ironically led by the Stonekeeper’s own daughter, Meechee (Zendaya) – plan to prove the smallfoot exist, and by doing so open the eyes of the rest of the village who all still believe that the laws of the ancient stones are not to be questioned. Now, this all sounds rather heavy, but it’s delivered in an incredibly light and easy to digest way so that kids should be able to take away the lessons to be learned from the story while also just enjoying the crazy, slapstick antics that Migo and company deliver along the way. There are some fantastic songs that help in this area, with wonderful lyrics that are not only catchy, but quite inspirational, from Channing Tatum singing the movie’s upbeat opening number “Perfection,” to Zendaya’s beautifully harmonic and insightful “Wonderful Life,” as well as the intensely fantastic “Let It Lie,” performed by Common. Each song helps further the story in its own way and each one knocks it out of the park in terms of lyrics and delivery. There’s also the incredibly funny “Percy’s Pressure,” sung by James Corden to the beat of “Under Pressure”, who plays Percy, a wildlife documentarian who has fallen from glory, finding it hard to compete in a world with cute animal videos so prevalently available online. In this song Percy pleads with his producer, Brenda (Yara Shahidi) to dress up as a yeti so that he can film a viral video in an attempt to regain the levels of fame that he was once accustomed to. I had no expectations going into Smallfoot and came away absolutely loving it. The story is just a lot of fun, and while it takes on serious themes at times, it also never takes itself too seriously, which helps it deliver its messages without feeling like it has an agenda. It simply wants the viewer of any age to know that questioning things in an attempt to get the proper facts and truth is a good thing, and that just because someone is different or you’ve only ever heard bad things about them doesn’t necessarily mean it’s the truth, and these are great messages to get out there – especially in our current political and social climate. 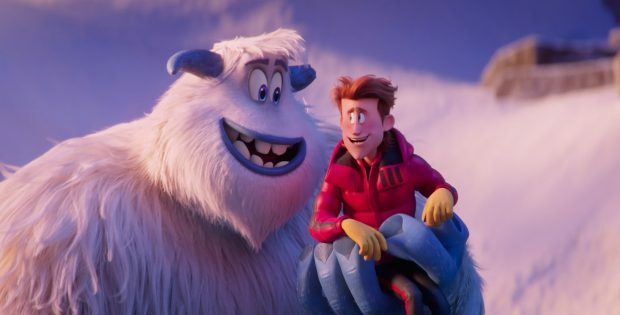 So if Smallfoot wasn’t on your viewing radar before this, make sure it’s there now, as this is a delightful, smile-inducing tale that shouldn’t be missed. The video transfer of the film to Blu-ray is crisp and vibrant. The animation is full of life, and whether it be in the snow-filled, bright daylight or the shadow-filled night, Smallfoot looks fantastic. On the audio front there are only positives as well, with the dialogue, sound effects and wonderful musical numbers and score all working harmoniously together to deliver on all fronts, never battling it out for ear supremacy. There’s a Sing-A-Long version of the film that can be chosen when you first choose to play the movie in case you or yours in the mood to, well, sing along with the characters! “Super Soozie” – This is a digital short that’s just over two-minutes long and focuses on the child-yeti Soozie and some of her classmates. Migo in The Secret Of The Yeti Stones – This featurette is a motion comic that’s just under four minutes long and is a very brief summary of the film voiced by Channing Tatum, while mainly focusing on the legend of the stones and what they mean to the yeti in the village. Definitely not a featurette to watch before you’ve seen the movie. Yeti or Not, Here They Come! Imagining Smallfoot – This featurette is just under six-minutes in length but gives a nice look behind the microphone, delving into where the idea for the movie came about, the voice cast and what they brought to the film, as well as the musical numbers. “Wonderful Life: In 28 Languages, Sung Around the World” Music Video – This is a really fun watch, getting to see all 28 singers belting out the lyrics over the course of the song. Really well done. Lastly, there are some brief comedic promotional videos. Warner Bros. Home Entertainment Presents Smallfoot. Directed by: Karey Kirkpatrick & Jason Reisig. Written by: Karey Kirkpatrick, Clare Sera, John Requa, Glenn Ficarra. Based on the book “Yeti Tracks” by Sergio Pablos. Starring: Channing Tatum, James Corden, Zendaya, Common, LeBron James, Danny DeVito, Gina Rodriguez, Yara Shahidi, Ely Henry. Running time: 96 Minutes. Rating: PG. Released on Blu-ray: Dec. 11, 2018.